WASHINGTON — President Donald Trump plans to confer with senior military leaders Monday, after he threatened a “big price to pay” for a suspected poison gas attack in Syria that killed women and children. Trump was set to get a briefing and have dinner with military leaders. Monday is the first day on the job for his new national security adviser, John Bolton, who has previously advocated significant airstrikes against Syria. The White House deliberations came as Russia and the Syrian military blamed Israel for a pre-dawn missile attack on a major air base in central Syria, saying Israeli fighter jets launched the missiles from Lebanon’s air space. A war-monitoring group said the airstrikes killed 14 people, including Iranians active in Syria. Syria’s state news agency SANA initially said the attack on the T4 air base was likely “an American aggression,” but Pentagon spokesman Christopher Sherwood quickly denied the United States was behind the strike and the agency then dropped the accusation, blaming Israel instead. 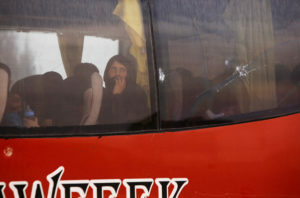 Saturday’s suspected poison gas attack took place in a rebel-held town near Damascus amid a resumed offensive by Syrian government forces after the collapse of a truce. Syrian activists, rescuers and medics said the attack in Douma killed at least 40 people, with families found suffocated in their houses and shelters. The reports could not immediately be independently verified. Officials in Washington worked Sunday to verify the claim by Syrian opposition activists and rescuers that the Assad government was responsible. Just over a year ago, Trump ordered dozens of cruise missiles to be fired at a Syrian air base after declaring there was no doubt Assad had “choked out the lives of helpless” civilians in an attack that used banned gases. White House advisers said at the time that images of hurt children helped spur the president to launch that air strike, and television new shows on Sunday aired similar depictions of suffering young Syrians. The developments come as Trump has moved to dramatically scale back U.S. goals in Syria, pushing for a quick military withdrawal despite resistance from many of his national security advisers. Trump has given no formal order to pull out the 2,000 U.S. troops in Syria or offered a public timetable other than to say the U.S. will withdraw as soon as the remaining Islamic State fighters can be vanquished. But Trump has signaled to his advisers that, ideally, he wants all troops out within six months. Images released by the Syrian Civil Defense White Helmets, a volunteer organization, show children lying on the ground motionless and foaming at the mouth. The Assad government, in a statement posted on the state-run news agency SANA, denied responsibility. Trump’s homeland security adviser, Thomas Bossert, noted on ABC’s “This Week” the timing of the suspected chemical attack — almost a year to the day of the U.S. missile strikes. Trump’s decision to single out Russian President Vladimir Putin in a tweet for supporting Assad appeared noteworthy because Trump long has been reluctant to personally criticize the Russian leader. Last month, Trump called Putin and, against the counsel of his advisers, congratulated the Russian president on his re-election and invited him to the White House. Trump also invoked Iran in his series of tweets, further challenging Tehran while signaling he may scuttle its nuclear deal with the West. The president has often blamed his predecessor, Barack Obama, for Assad’s continued grip on power after years of civil war. Obama said in 2012 that Syria’s use of chemical weapons would be a “red line” that would change his decision-making on intervening in the war and have “enormous consequences.” After such an attack in 2013 killed hundreds outside Damascus, American ships in the Mediterranean were poised to launch missiles. But Obama pulled back after key U.S. ally Britain, as well as Congress, balked. He opted for a Russian-backed proposal that was supposed to remove and eliminate Syria’s chemical weapons stockpiles.